Wat is dit voor site? Wij zoeken de goedkoopste boeken op internet. Footprintsvonden we het goedkoopst op Bol.com voor €14.99. We hebben gezocht in nieuwe en tweedehands boeken. Rechtsonderaan de pagina kan je het boek direct bestellen	via Bol	.com. When you saw only one set of footprints, it was then that I carried you. 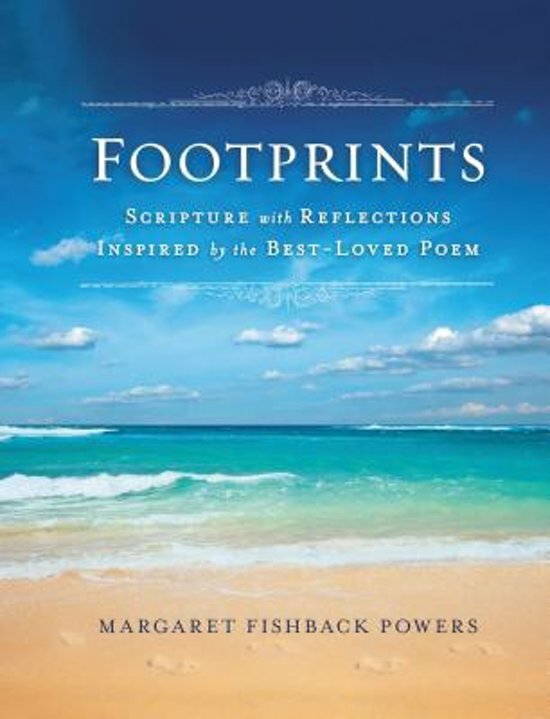 The poem Footprints by Margaret Fishback Powers has brought comfort and encouragement to generations of readers. Why has Footprints endured while so many other poems have been forgotten? It's message of God's loving kindness and constant care of people who are hurting, lonely, or suffering. Footprints reminds us He who carried the sins of the world will carry His children too. Few whose lives have been touched by its gentle words know the story behind the poem. Footprints:Scripture with Reflections Inspired by the Best-Loved Poem includes the poignant story behind the poem. In this deeply moving book, Margaret Fishback Powers recounts the circumstances in which she discovered the depths of God's love. Readers will enjoy the behind-the-scenes story of the poem's mysterious disappearance and miraculous rediscovery. With a padded hardcover and beautiful, beach-themed design, this book makes a great gift to give someone who needs encouragement through a hard time or those who simply enjoy the reminder of God's grace and constant care.